“Thanks to the Roanoke Chamber Brass for allowing me to be part of your Christmas Concert. It was alot of fun, and you guys did a magnificent and festive concert for all to enjoy! I hope I can be a part of it again! “Thank you so much for your cooperation, cheer, and diligence. The general consensus of the worshipping assembly was, “Marvelous”, and you were specially thanked by the Bishop the next morning. One pastor present had this to say about how much he enjoyed the “Sonata from Die Bankelsangerlieder”…….”VERY polished and engaging”. 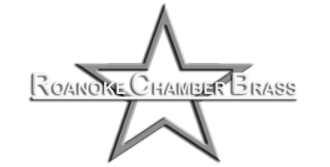 The Roanoke Chamber Brass is available for public and private concerts, recitals, weddings, church worship services, school performances, ceremonies and special events. To check our availability and rates, please use the form on our "Contact Us" page. Please click the icon below to visit our facebook page.